Update: UCI confirms the presence of a motor on Femke Van den Driessche’s bike in Sunday’s press conference, and U23 bronze medalist Quinten Hermans weighs in. More details below. The details are as clear as the Zolder mud, so stay tuned for more updates on this breaking story as it develops. Here’s our summary of this development as it currently stands. 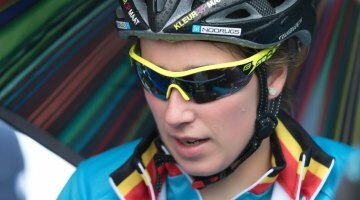 The bike is from Femke Van den Driessche, the current Belgian and European Women’s U23 Champion. 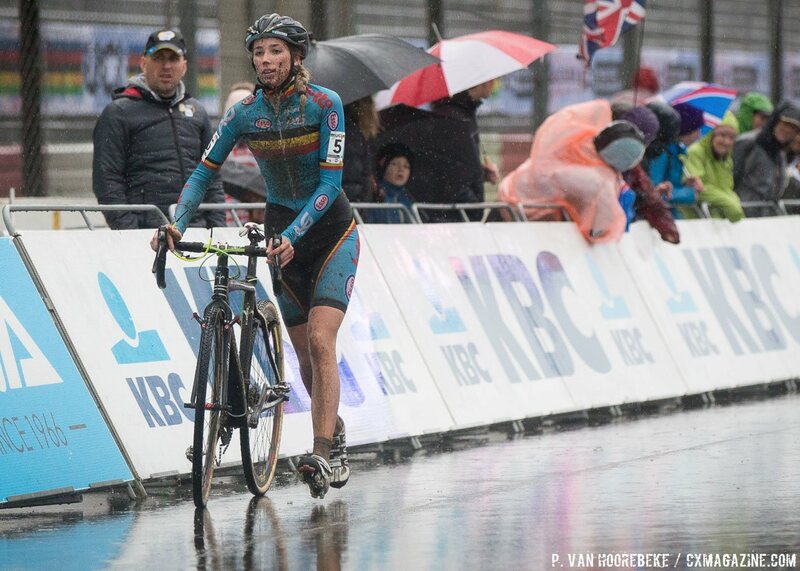 Femke Van den Driessche had mechanical issues both at the start and at the finish and was visibly upset after her race and did not receive a finishing place. Tests have been done since the Hoogerheide UCI Cyclocross World Cup in 2014 to look for motors. Now these tests have found something. The UCI has an app and tablet to scan bikes. Peter van de Abele confirmed that the UCI is able to scan bikes in seconds. “Through our (developed) app on a tablet, the bike can be scanned and analyzed in no time,” he said, according to demorgen.be. 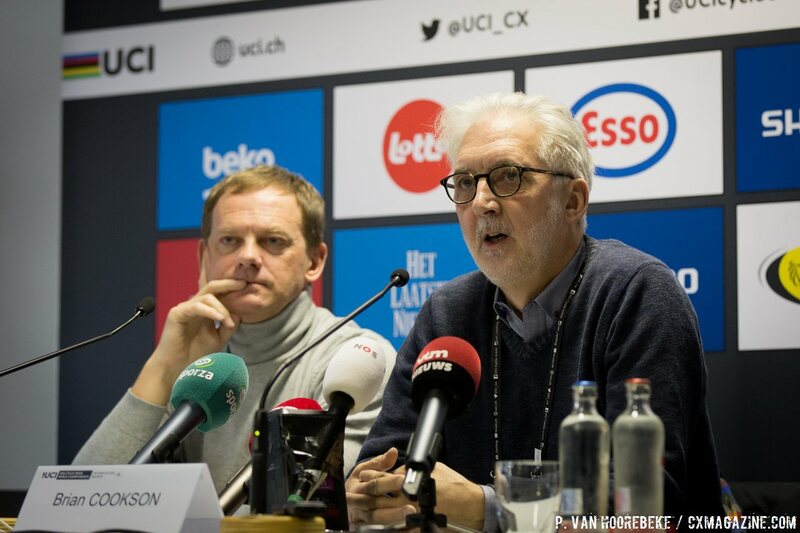 Brian Cookson of the UCI held a press conference on Sunday, 10 a.m. CET to address this topic. 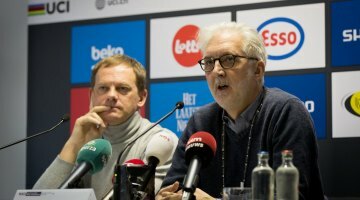 The proceedings will be legal in nature, and Cookson did elaborate on next steps, which could include sanctions of not only the rider but perhaps teams or staff. Rider can pay up to 200,000 Swiss Francs and the team may have to pay up to 1 million and her suspension can be up to lifetime. It’s certainly a new situation for all involved. 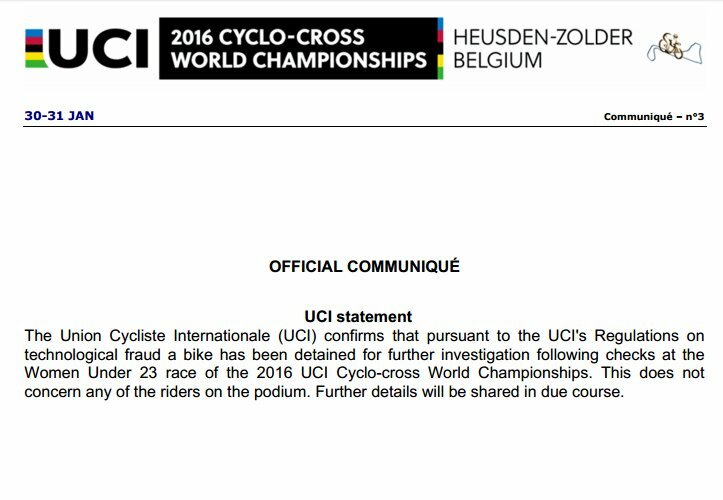 The UCI’ confirmation seems to imply the bike was used in competition. As to why someone would bring an obviously illegal bike into the pits, even if not to be used, is inexplicable. It’s not much different than inviting an EPO user to bring vials over to your trailer that you don’t plan to use. Fast climbing does not indicate mechanical doping obviously, but as Velofacts points out, her times are impressive. You can see her climb the Koppenberg here. It’s also worth noting that Femke Van den Driessche’s brother Niels is currently suspended due to EPO usage. Do family values matter? 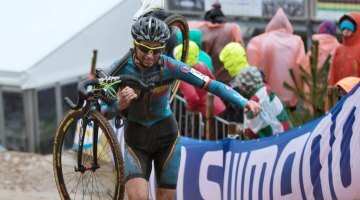 @cyclocross have you guys heard anything about the girl in u23s that had a motor on her bike? Stay tuned as we bring you the latest on this breaking story, but don’t let it overshadow the great racing from today. See the ever-growing collection reports, results, photos and videos from the 2016 Cyclocross World Championships here. 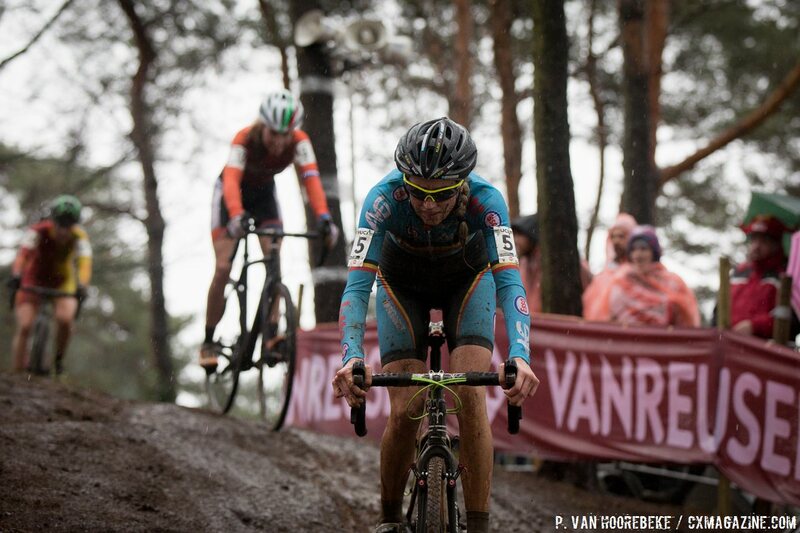 cyclocross “The details are as clear as the Zolder mud…” Awesome! cyclocross This is great work for (dare i say the busiest) saturday. Excellent read. meowclank cyclocross Isn’t she the one that fell on the downhill during the first lap “couldn’t slow down” ??? bobwassell Thanks! It’s worth the super early morning…and it takes a team for sure. doctordiscodave It’s sad. 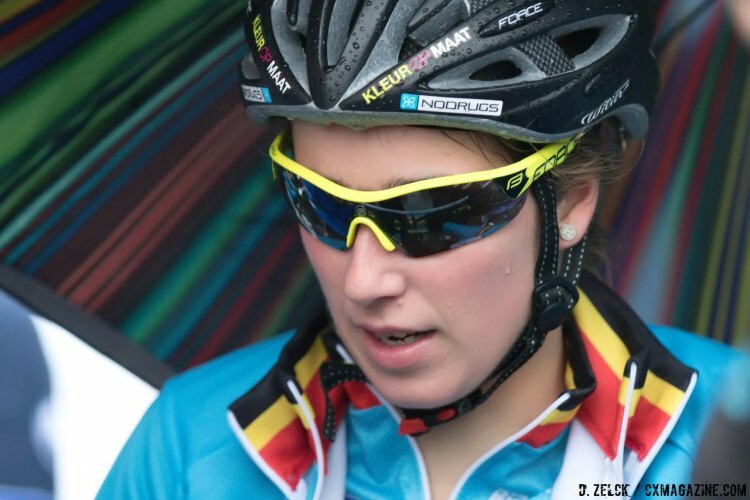 Lots of speculation now about her other rides – and other riders possibly uncaught. I guess the excuse makes sense. When I’m in the pits, I try and crowd the area with all my friends’ bikes as well as Kate’s pit bike. Keeps things nice and cluttered. Right. And you leave Sudafed packaging around too, right? And all your random inhalers and syringes? But they’re only for you? cyclocross velolouisville PodiumCafe and yet nobody praises how the ipad survived in the heavy rain during the women u23 race?! cyclocross Or is “No Drugs” the name of one of her sponsors? Or the Cam Newton excuse..,my dad did it and I didn’t know. cyclocross CXHairs UCI_cycling does it matter whether she actually rode it if it was in her pit? Doesn’t that indicate intention? Time splits from the BPost Bank Trofee Veldrijden #2. Check out her time up the Koppenberg compared to everyone else. Looks like it wasn’t the first time she tried to use the motor. cyclocross Great. Responsible. Reportage. #facts. ? Chris Arndt h/t to you. Good stuff. “It’s just cyclocross” but it means everything. sturmey DaveHaygarth baffling they would even have one in possession, no? bikesnobnyc Where’s the juice? Did they find a battery? Coullio82 bikesnobnyc cyclocross I believe the UCI referred to it as “technological fraud”. bikesnobnyc Because the e-bike food delivery jokes practically write themselves. But the U23 field? This is more befitting the AARP set. bikesnobnyc was it you that coined the phrase moping? How many times has an announcer said that a rider in a solo break was really “motoring?” Who knew they simply were early adopters. Rich, that rider is firing on all cylinders, really powering away. Myke Berna, when will you be selling these at the shop? cyclocross UCI_cycling BrianCooksonUCI this should be a good one. Coullio82 anthonyseiver bikesnobnyc cyclocross How about cheating? That term works well. 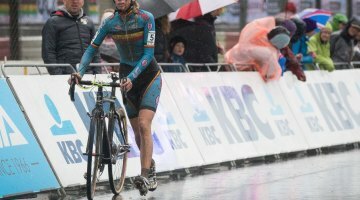 stop saying “mechanical doping”. Its “cheating”. If they just say “cheating”, how will know what type of cheating? Maybe she just had 34mm wide tires, which is cheating, too. I think “cheating” writ large is clear enough. Its not doping. That just cutesy mod speak. I’m really curious how the whole “contaminated supplement” defense is going to work in this case. Ban for life!!! This is totaly wrong! Worse then Armstrong!!! someone from her Entourage, so was it Turtle or Drama?